Three weeks ago, Rob Cakebread contacted me vis-�-vis some possible issues with the PingtheSemanticWeb.com web service. Rob is involved with the development of Gentoo Linux and he wanted to come-up with a method to let their development teams know when new packages are released for some projects. Since the RSS feeds of Freshmeat.net are limited in length, and that they do not support DOAP, he started to think about a way to convert Freshmeat.net’s data projects into RDF using the DOAP ontology. That way, he could easily create services to track the release of new packages and then increasing the effectiveness of their development teams. I came across ptsw.com when trying to determine how many package indexes are using DOAP right now (so far I’ve only found Python Package Index and O’Reilly’s Code Zoo). I’m a developer for Gentoo Linux. A website I created (Meatoo) checks Freshmeat twice a day and finds packages that have new releases available. We have a database of all our maintainers grouped into ‘herds’, a Python herd, desktop herd, PHP herd etc. The developers in the herds can query my website by a command-line client that uses XML-RPC, or subscribe to RSS feeds by herd or package name, or read the website itself and see which packages have new releases. DOAP fits into this because I was thinking about creating DOAP records for each release from each package index and making this available so people can write tools to find out information about software packages easily. Its how we got in contact. Rob had a practical problem, then he tried to find a way to resolve it and to help other people to resolve it too; and its how he found PingtheSemanticWeb.com and other semantic web related projects and communities (such as the Linked Open Data). Then a couple of days ago, Rob re-contacted me to let me know that the Freshmeat.net’s 43 000 projects description is now available in RDF. He created a prototype service that converts the data he has aggregated from Freshmeat.net into DOAP. Its project is called DOAPSpace. The idea is to make available the Freshmeat.net projects into DOAP, then to ping PingtheSemanticWeb.com to ultimately make them available on Doapstore.org that is feeded by PTSW. I was really pleased to see how Rob managed to generate that data. Then I asked him if a RDF dump of that precious data would eventually be available for download? It is exactly what he is doing at the moment, and as soon as he send me the dump, I will make it available via PingtheSemanticWeb.com. Then, it will be ready to be integrated into the Linking Open Data project. At the same time, Rob added a new feature to its service; a user only has to append the “?zg=1” parameter to the URL to get redirected to the Zitgist Browser. It was really nice from him to think about that; I really appreciated. However, I introduced him at how he could use content-negotiation to do that and to make its service compatible with other tools such as other RDF browsers. So I pointed him to the How to Publish Linked Data on the Web draft document so that he can have a better understanding of the content-negotiation process. Rob is certainly an early adopter of the Semantic Web. He is a developer that wants to solve problems with methods and technologies. He had the intuition that the DOAP ontology and other semantic web principles and technologies could help him to solve one of its problems. This intuition leaded him to discover what the semantic web community could do to help him. It’s the kind of user we have to take care of; and that we have to help to release their projects. Its people like Rob that will make the Semantic Web a reality. Without such early adopters, from outside of the Semantic Web Community, the semantic web is probably doomed. We are there now; ready to help developers to integrate semantic web technologies into their projects; to generate their data into RDF and to link it with other data sources. It’s the goal of communities like the Linking Open Data Community and its what we are about to do. Zotero is a great FireFox add-on that lets its users find, search, edit and create citations they find on the Web while browsing it. All the power of Zotero resides in its “translation modules“. These modules will detect citations in various types of web pages. When it detects one of these citations, it will notify its users to give them the opportunity to save them. What interest me is that Zotero already use some ontologies to export users’ citations libraries using RDF. When I noticed that I started to wonder: what could we do with Zotero now? Zotero is the best-integrated citation tool for the Web I know. A phenomenal amount of citations can be discovered on the Web via Zotero users community. Remember what we have done with the Semantic Radar a couple of months ago? This FireFox add-on was detecting SIOC RDF documents in Web page. Then I contacted Uldis Bojar to ask him to ping PingtheSemanticWeb.com each time a user was detecting a RDF file while he was browsing the Web. Now a good source of RDF data pinged to PTSW come from Semantic Radar users. This is a sort of “social semantic web discovering” technique. What I would like to do is the same thing but for Zotero. Zotero users browse the Web, discover citations and save them into their personal libraries. Each time a Zotero instance discover a citation, it would send the URL where we can find it to PingtheSemanticWeb.com. Note: the user should be aware of that functionality via an option into Zotero that would explains him what this feature it is all about, and to gives him the possibility to disable it. Note: Zotero would ping PTSW each time it detects a citation (so that the icon appears in the FireFox’s URL bar), and not each time a user save it. 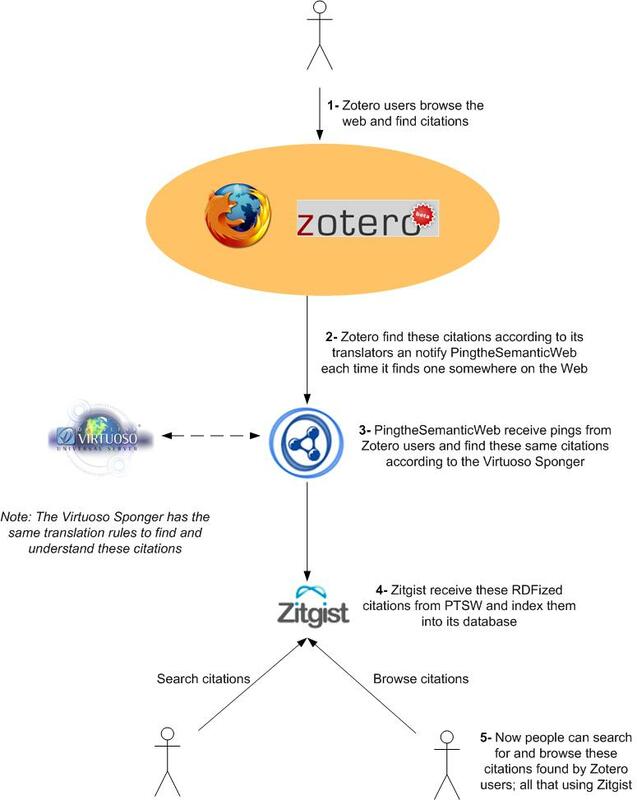 Via the Virtuoso Sponger, PingtheSemanticWeb.com will check the incoming URL from Zotero users and will check to find citations too. If a citation is found, it will be added to its list of know citations and archive their content. PingtheSemanticWeb.com will then send the new citations to Zitgist so that it can include them into its database. Note: here Zitgist could be replaced by any web service wanting them. Remember that PTSW act as a data-multiplexer. Via Zitgist (that is a semantic web search engine), users from around the World will be able to search among these citations (discovered by Zotero users) and to browse them. What is fantastic here is that Zitgist become a source of citations. So if a Zitgist user has Zotero installed, then he will be able to batch-save the list of results returned by Zitgist; and if the user is browsing Zitgist’s citations, he will be able to include them into their Zotero instance like if Zitgist would be Amazon.com or any other citations web sites. That way, Zotero’s found data would be accessible to Zotero users via Zitgist that would then become a citations provider (mainly feed by the Zotero community). What have to be developed? Some things have to be developed to make that vision working. No major development, but only a couple of features to develop on each system. The integration of Ping the Semantic Web into Zotero is quite straightforward. The first step is to make Zotero notify PTSW each time it comes across a citation. It has to send the URL of that/these citation(s) via XML-RPC or REST. That is it. Each time Zotero detect a citation, it sends a simple ping to PTSW via an XML-RPC or REST request. Another thing that Zotero would have to add to their add-on is an option that would gives the possibility to their users to disable that feature in case they don’t want to send a notification to PTSW each time they discover a citation on a Web page while they are browsing the Web. The biggest development effort that would have to be done is to convert the Zotero translators into Virtuoso Sponger’s Metadata Cartridge. Right now, Metadata Cartridge exists for: Google Base, Flickr, microformats (hReview, hCalendar, etc. ), etc. These cartridges are the same things as “Zotero translators” but for the Virtuoso Sponger. By developing these cartridges, everybody running Virtuoso will be able to see these citations (from Amazon, etc.) as RDF data (mapped using some ontologies). Documentation about how to develop these cartridges will be available in the coming days. From there, we would be able to setup an effort to convert the Zotero Translators into Spongers Metadata Cartridges. This is the vision I have of the integration of Zotero into the current Semantic Web environment that exists. Any ideas, suggestions, collaboration propositions would be warmly welcome.